In 1853 Japan, school teacher Nishiyama Genta foretells of disasters as predicted by the French healer and alleged seer, Nostradamus. Decades later, a Nishiyama descendant in WW2 is arrested for spreading the potential gloomy gospel of Nostradamus. Years later in 1974, the next Nishiyama, a research scientist and pediatrician, attempts to thwart the predicted, and ever escalating cataclysms that possess the potential of wiping out all of mankind in the year 1999. In the 1970s a flood of disaster movies washed away the competition at the American box office. Granted, there had been examples of this type of film using an 'End of the World' formula in such pictures as Roger Corman's THE DAY THE WORLD ENDED (1956) and THE LAST MAN ON EARTH (1964). This sort of cinema owes its lineage to such scary, Armageddonish novels such as George R. Stewart's Earth Abides from 1949 and Richard Matheson's I Am Legend from 1954. In Japan, a similar "catastrophe" occurred with the enormous success of SUBMERSION OF JAPAN (1973). 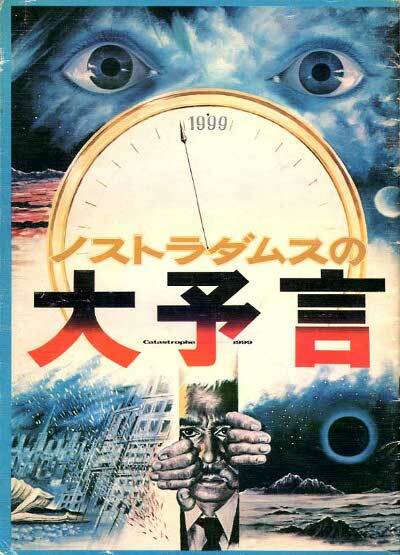 Wishing to replicate that success, producer Tomoyuki Tanaka followed it up with this far more darker motion picture essentially about the Submersion of Man; the complete and total destruction of life on Earth. Upon closer inspection, Masuda's movie bears an uncanny resemblance to the British Armageddon film NO BLADE OF GRASS (1970), but is far more relentless in its violence. Despite a number of scenes bordering on crass exploitation and a handful of stock footage destruction scenes, this production is ambitious in scope and appears to have had a sizable budget attached to what is essentially an environmentalist version of 1961s THE LAST WAR, an early 'End of the World' movie from director Shue Matsubayashi. While that film was devastating in the fate of its characters and situations, PROPHECIES OF NOSTRADAMUS is a far more potent example of cinematic radiation with its unrelenting nihilism that overpowers any attempt at exposition. If the increasingly nauseating sequences of death and destruction don't pummel you into a state of catatonia, than the excessive leftist propaganda speeches will. Nearly every line of dialog oozes an extreme left wing mentality to such a degree, you almost expect Tom 'Billy Jack' Laughlin to make a cameo. And here we all are, nearly forty years later and environmentalists continue to keep such scare tactics alive today predominantly with the alleged existence of global warming. Yoshimitsu Banno, the man who almost single-handedly let loose an Oxygen Destroyer all his own on the Godzilla series with the lamentable fan favorite GODZILLA VS. THE SMOG MONSTER (1971), wrote this films incredibly brazen script; a script that comes off as the deadly serious big brother of the Godzilla picture. Regarding the script, PROPHECIES OF NOSTRADAMUS is credited to Toshio Yasumi out of respect for his work on THE LAST WAR (1961) since it's basically the same movie, if not the single most heavy handed environmental movie of all time. Among the insurmountable number of grotesqueries and effects laden disaster sequences are enormous, two foot long slugs; gigantic plant life interrupting subway chains; zinc poisoned water turning children into X MEN style mutants with terminal super abilities; giant bats; hallucinogenic leeches; radioactive cannibalistic natives and more. Teruyoshi Nakano's elaborate effects work that isn't recycled from Tsuburaya's work on THE LAST WAR (1961) include snowy Egyptian locales; a frozen Pacific Ocean; holes in the ozone that cause people to suffer acidic like burns; massive floods; a Fukushima nuclear disaster(! ); rampant destruction and a cataclysmic finale with the worlds nations firing ICBM's at each other till the Earth is reduced to a burnt, cracked wasteland. We're then treated to a nasty, controversial sequence of two epidermally exposed, child-like monstrosities battling over who gets to eat a snake; effectively engaging in a new beginning of the end that brought the human race to this very point in the first place. The one major misstep in all of this is that there are so many disasters piled on top of each other, some of them are seemingly forgotten about in later sequences. The destruction of the ozone layer precipitating an onslaught of deadly ultraviolet rays is seemingly abandoned to make way for the next special effects set piece. In another example, the flooded Japanese cities are later shown to be dry, yet empty streets. Whether you enjoy this unfathomably heavy handed, thickly political, epic disaster movie or not, there's one thing that stands above all else and that's the incredibly somber, utterly memorable score by Isao Tomita. Sounding far more like it belongs in an Italian horror movie instead of a Japanese picture, Tomita's score is simply one of the best series of compositions ever affiliated with the medium. The main theme erupts in an opulently doom-laden grandeur that's extraordinarily opposed to what normally passes for that unmistakable Nipponese sound. While Masuda's movie never strives to be a feel-good presentation, time has not been kind to the film. Two key sequences caused such a major uproar with post WW2 human rights groups, Toho decided to pull the film just a few days into its release. It was later re-released in a drastically altered version minus the offending segments (the harrowing New Guinea sequence featuring flesh-eating natives and victims literally rotting away alive; the scene with the deformed, mutated humans) and close to 30 minutes of its running time. In America, another cut was made, but it too was shorn of around 30 minutes of footage and retitled THE LAST DAYS OF PLANET EARTH. The film is under a self imposed ban by Toho and has never been officially released on any format in its uncut form. Reportedly, it did play uncut on Japanese television in 1980 on one occasion and has never been seen since save for revival showings of the severely truncated version. PROPHECIES OF NOSTRADAMUS leaves no disaster unaccounted for and no political stone unturned. It's the ultimate motion picture experience of eco-maniacs around the world. It's also a curious, fascinating, yet flawed film that proved to be shockingly prophetic in some of its depictions despite being grossly exaggerated in a great many others.